As a singing program for keeping your voice in tune, this might be one to consider. But, to decide if this vocal training course is right for you, I’d suggest reading this PitchPerfector review from start to finish. 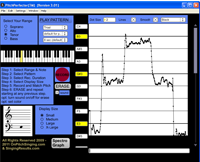 In a quick sentence, PitchPerfector is a very effective voice training software package which can be used in your computer to monitor vocal performance. In fact, the singing program helps you to get on track sometimes within just a few minutes. The author of the program is Stephen Pierce. The software system for singers has managed to live up to its potential and has exceeded the expectations of many new and experienced vocalists. Vocal pitch is the focus of the program. PitchPerfector is loaded with interface utilities along with match patterns and some other features to help you sing better. It helps you to point out the problems you have in your pitching and shows you exactly how to get rid of them. The program comes with a step-by-step visual presentation about how it works and how you can use it to improve your singing voice. The rising and falling of pitch can be seen on the computer monitor. This helps greatly in matching the exact scale. As mentioned earlier, you can observe your vocal performance on screen. You can see the right scale for each note and the level of your pitch. It cannot get easier than this. You will have to lower or raise your pitch to match the right one – one of the more difficult tasks. The result is almost instantaneous. Unlike many other vocal training programs that take days or sometimes weeks to improve your singing capacity, Pitch Perfector works very quickly. Boosts your confidence by giving a tone that is unique to you. Unless the users already have some experience with notes and pitches, they could face some difficulties with the program training. It will take a longer period of time than advertised to match the right pitch.